Currently, the HFI shows that financial institutions are significantly safer today with a score of 1.28, 28 percent higher than historical norms. The rise in the HFI reflects growth in capital. 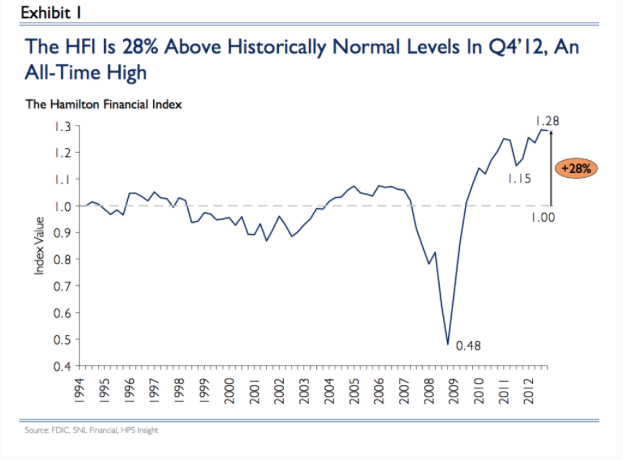 If capital levels remained at pre- crisis levels, the HFI would be below pre-crisis norms with a reading of 0.95. U.S. banks Tier One Common Capital ratio is 12.6 percent, a year-over-year increase of 1.3 percent. U.S. banks Tier One Common Capital increased to $1.13 trillion. The ratio of Risk-Weighted Assets to Total Assets fell 1.3 percent year-over-year. Financial stress declined in the fourth quarter of 2012.